Dar as Sunnah are honored to bring another classical work of the Imam Al Hafiz Ibn Rajab in the English language. 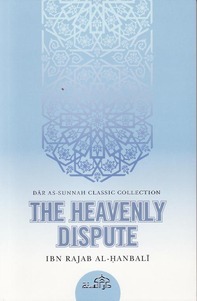 It is an important commentary on the noble hadith of the Prophet Muhammed (peace and blessings of Allah be upon him) that was recorded in the collection Sunnan Tirmidhi relating the dispute among the chief Angels of the Highest Heaven. The dispute arose about deeds that expiate sin and raise a person’s rank in the Hereafter. Therefore it is necessary for every Muslim to take extra keen interest in learning its lessons, understanding its values and applying its highly prized recommendations. The esteemed author beautifully explains the hadith in details and highlights the importance of enacting righteous deeds by which Allah wipes out with them, sins and wrongdoings, while elevating a person to higher degrees on the Day of Judgment. The hadith also comprises great supplications that the Prophet (peace and blessing be upon him) was given in the lofty encounter with his lord; all of which occurred when he all of a sudden felt drowsy until asleep overtook him during the night prayer. He additionally discuses concepts of dreams and miracles, the excellence of ablution and performing it well, performing prayer in congregation, the night prayer, walking to the Masjid, feeding the poor and one's neighbours, right etiquette in speaking, having humility and contentment, enjoining the love of Allah and increasing it for purpose of drawing closer to Him. This work motivates people to go beyond fulfilling their roles as Muslims by not taking seemingly smaller actions for granted. The spiritual dimension to these actions will add to the aspirations in our increased servitude to Allah. Every Muslim is therefore, in need of this precious advice that aims to leave a lasting positive impact on all those who come to embrace its contents.